It is quite possible that Ben Lee made a deal with the devil. The only question is whether his one wish was to make this one truly great album or to date Claire Danes for a few years. Better question? Which one did he accomplish without making the deal and which was therefore the greater accomplishment? For Fans of: folk rock, pop rock, and clever lyrics with plenty of pop culture and literary references. And heart wrenching love songs that remind you how it felt as a teenager when YES, it REALLY was that important to you for reasons you can no longer recall. For those that remember this one, you get it. For those that don't, this one probably gets you. In last week's excellent, life-changing year end music blog covering 2009, I wondered aloud if Dirty Projectors could ever repeat the greatness of this year's excellent Bitte Orca. While that remains to be seen, I already have the answer for one Ben Lee. A resounding "NO". Like hell no. But beneath that seemingly insulting conclusion is the absolute greatness of 1997's Something to Remember Me By. Written and recorded between the ages of 17 and 18, Lee sounds every bit of it. And that's OK. Yes, the lyrics are smart, clever, literate, and at times extremely reflective for someone of his age. But the passion, angst (but never in an annoying way), and vulnerability are all "teenaged". The songs range from surviving heartbreak (the aptly titled "How to Survive a Broken Heart") to surviving self-loathing ("Ketchum") to surviving post adolescent stardom as a child actor (the brilliant and funny as hell "Household Name"). Lee touches on the awkward romanticism of childhood love and the beautiful feeling when you run into that person again by chance ("Eight Years Old"). Lee even touches on the origins of his relationship with Danes at the time and the feeling that this was tragically destined to end all too soon in the gorgeous "Daisy". And "End of the World" is a hilarious and strangely touching song about what happens when you find out the world is about to blow up. As much as I will always hold certain artists close to my heart who have proven themselves over and over again with a tremendous body of work, I have learned over the years that sometimes a great album can truly stand alone without having its greatness in any way compromised by the artist's future efforts that never quite measure up. Such is the case with Something to Remember Me By. 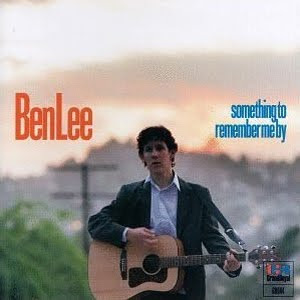 Unlike almost any other great album I have where I can recall the specifics regarding how I first came to discover it, I can't for the life of me tell you how I learned of Ben Lee or this record. It's like it just appeared in my life, my memory, my history in some mysterious yet vital fashion. All I knew is that he and I were about the same age and he played the guitar and sang and put to music the words that I totally knew I'd sing if I had the chance or the gifts or the blood and guts to do so. Even now at age 30, this album still affects me as some sort of audio snapshot of every feeling and urge and sense of immediacy that I felt back then and honestly don't feel now. Those days were messy and confusing and not enough and too much. Ben Lee got that for me. This is the summary of that existence that lives on in perpetuity. And of course, something to remember that "me" by. MP3 Link: Cannot find one. Not on iTunes, Amazon, or lala. Ask me and I'd be happy to burn it for you. Though you CAN listen to audio samples on Amazon here. The CD is out of print because the original label, Grand Royal, is now defunct. You can pay too much for a copy or you can scour used CD stores. Or just ask me and maybe we can work something out.